We recently completed the design and construction of a restoration and modification project in Portugal. Check out the slideshow to see the before and after photos. After a strong finish to 2011 and slow start 2012 (slow only in terms of blogging), I would like to share this really cool project with you. For those interested in becoming Architects, Architecture Education is offered in an increasing amount of ways. From night school to accredited online degree programs, it is possible to participate in the evolution of structure and design. Design and community inspire learning and technological advancements expand the possibilities for what will stand and what will not. The movement toward a environmentally friendly society also creates a need for students who have fresh ideas and a green thumb, so to speak. In the coming decades, the need for students with the knowledge necessary to convert old buildings into efficient ones will give many a chance at a career that makes an impact on the beauty and function of the world around them. Designed by Mima Architects, the Mima House has a modular structure and can be divided into rooms with a grid of removable partitions. This prefabricated house in Portugal costs about the same price to manufacture as a family car (all photographs by José Campos). Plywood panels transform the windows into walls to create privacy where necessary. The Carmo Convent (Portuguese: Convento da Ordem do Carmo) is a historical building in Lisbon, Portugal. The mediaeval convent was ruined in the 1755 Lisbon Earthquake, and the ruins of its Gothic church (the Carmo Church or Igreja do Carmo) are the main trace of the great earthquake still visible in the city. The Carmo Convent is located in the Chiado neighborhood, on a hill overlooking the Rossio square and facing the Lisbon Castle hill. It is located in front of a quiet square (Carmo Square), very close to the Santa Justa Lift. Nowadays the ruined Carmo Church is used as an archaeological museum (the Museu Arqueológico do Carmo or Carmo Archaeological Museum). Belém Tower (in Portuguese Torre de Belém, or the Tower of St Vincent is a fortified tower located in the civil parish of Santa Maria de Belém in the municipality of Lisbon, Portugal. It is an UNESCO World Heritage Site (along with the nearby Jerónimos Monastery) because of the significant role it played in the Portuguese maritime discoveries of the era of the Age of Discoveries. The tower was commissioned by King John II to be part of a defense system at the mouth of the Tagus River and a ceremonial gateway to Lisbon. The tower was built in the early 16th century and is a prominent example of the Portuguese Manueline style, but it also incorporates hints of other Architectural styles. The structure was built from lioz limestone and is composed of a bastion and the 30 meter (100 foot), four story tower. It has incorrectly been stated that the tower was built in the middle of the Tagus and now sits near the shore because the river was redirected after the 1755 Lisbon earthquake. In fact, the tower was built on a small island in the Tagus River near the Lisbon shore. Its plan is composed of a rectangular tower and an irregular, hexagonal bastion, with elongated flanks, that projects south into the river. It is basically a large articulated vertical space resting on a horizontal mass/slab, covered by exterior enclosures. On the north-east angle of the structure, protected by a protective wall with bartizans, there is a drawbridge to access the bulwark, decorated in plant motifs, surmounted by the Royal coat of arms and flanked by small columns, complimented with armillary spheres. The Manueline armillary spheres appear at the tower’s entrance, symbolizing Portugal’s nautical explorations, and were used on King Manuel I’s personal banner to represent Portuguese discoveries during his rule. The decorative carved, twisted rope and elegant knots also point to Portugal’s nautical history and are common in the Manueline style. On the outside of the lower bastion, the walls have spaces for 17 canons with portholes open to the river and an ocular in the north. The upper tier of the bastion is crowned by a small wall with bartizans in strategic places, decorated by rounded shields with the cross of the Order of Christ that circle the platform. King Manuel I was a member of the Order of Christ and the cross of the Order of Christ is repeatedly used numerous times on the parapets. These were a symbol of Manuel’s military power, as the knights of the Order of Christ contributed to numerous military conquests in that era. The bartizans, cylindrical watchtowers in the corners are cover in zoomorphic corbels and domes covered with buds. The corners of this platform have turrets (guerites) topped by Moorish-looking cupolas. The base of the turrets have images of beasts, including a rhinoceros. This rhinoceros is considered to be the first sculpture of such an animal in Western European artand probably depicts the rhinoceros that Manuel I sent to Pope Leo X in 1515 (which was caged in the tower at one time). While the tower is prominently Manueline, it also incorporates hints of other architectural styles. The tower was built by the military architect Francisco de Arruda, who had already built several fortresses in Portuguese territories in Morocco. The influence of Moorish architecture manifests itself in the delicate decorations, the arched windows, the balconies, and the ribbed cupolas of the watchtowers. The Tower has four storeys, with fenestrations and battlements, with the ground floor occupied by a vaulted cistern. On the first floor, there is a south-facing rectangular door, with arched windows in the east and north, and bartizans in the north-east and north-west corners. The southern part of the second floor is taken-over by a covered veranda with matacães (or loggia), constituted by an arcade of seven arches, resting on largecorbels with balusters. It is covered by a lace stonework to form a porch, and its sloped roof ends in a sculpted twisted rope. The eastern, northern and western walls are occupied by double-arch enclosures, with the north-east and north-west corners occupied by statutes of Saint Vincent of Saragossa and the archangel Michael in niches. The third floor has twin-windows in the north, east and west façades, with balusters, interspersed by two armillary spheres and large relief with the Royal coat of arms. The final floor is encircled by a terrace with shields of the Order of Christ, and a northern arched door and eastern arched window. The terrace is circled by a low wall with colonnaded pyramidal merlins with bartizans in the four corners. A similar terrace above this floor offers a view of the surrounding landscape. The interior part of the bastion cave, with a circular staircase in the north, has two contiguous halls with vaulted ceilings supported by masonry arches, with four lockers and sanitary installations. On the ground-floor bunker, the floor is inclined towards the outside, while the ceilings are supported by masonry pilasters and vaulted spines. Gothic rib vaulting is evident in this casemate, the rooms of the tower and the cupolas of the watchtowers on the bastion terrace. Peripheral compartments on the edges of the bunker, allow the individual canons to occupy their own space, with the ceiling designed with several asymmetrical domes of various heights. The ancillary storerooms were later used as prisons. Two archways open to the main cloister in the north and south, while six broken arches stretch along the eastern and western parts of the cloister, interspersed with square pillars in the bastion cave, with gargoyle facets. The open cloister above the casemate, although decorative, was designed to dispel cannon smoke. The upper level is connected by a railing decorated with crosses of the Order of Christ, while at the terrace the space is guarded by columns topped by armillary spheres. This space could also be used for light-caliber infantry. This was the first Portuguese fortification with a two-level gun emplacement and it marks a new development in military architecture. Some of the decoration dates from the renovation of the 1840s and is neo-Manueline, like the decoration of the small cloister on the bastion. On the southern portion of the cloister terrace is an image of Virgin and Child. The statue of the virgin of Belém, also referred to as Nossa Senhora de Bom Successo (Our Lady of Good Success), Nossa Senhora das Uvas (Our Lady of the Grapes) or the Virgem da Boa Viagem (Virgin of Safe Homecoming) is depicted holding a child in her right hand and a bunch of grapes in her left. The tower is about 12 metres (39 ft) wide and 30 metres (98 ft) tall. On the first floor interior of the Tower is the Sala do Governador (Governors Hall), an octagonal space that opens into the cistern, while in the north-east and north-west corners there are corridors that link to the bartizans. A small door provides access via a spiral staircase to the subsequent floors. On the second floor, the Sala dos Reis (King’s Hall) opens to the loggia (to overlook the river), while a small corner fireplace extends from this floor to the third floor fireplace in the Sala das Audiências (Audience Hall). All three floor ceilings are covered in hollow concrete slabs. The fourth floor chapel is covered in a vaulted rib ceiling with niches emblematic of the Manueline style, supported by carved corbels. 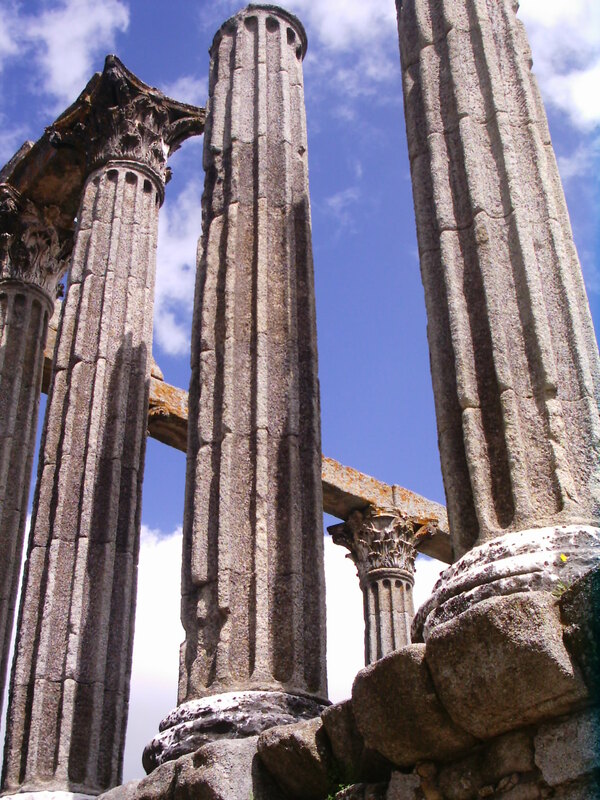 Did you know that Portugal has it own Roman temple? Check out the following excerpt from Wikipedia.org. The Roman Temple of Évora (also referred to as the Templo de Diana, after Diana, the ancient Roman goddess of the moon, the hunt, and chastity) is an ancient edifice in the city of Évora, Portugal. The temple is part of the historical centre of the city, classified as a World Heritage Site by UNESCO. It is one of the most famous landmarks of Évora and a symbol of Roman presence in Portuguese territory. Although the Roman temple of Évora is often called Temple of Diana, any association with the Roman goddess of hunt stems not from archaeology but from a legend created in the 17th century by a Portuguese priest. In reality, the temple was probably built in honour of Emperor Augustus, who was venerated as a god during and after his rule. 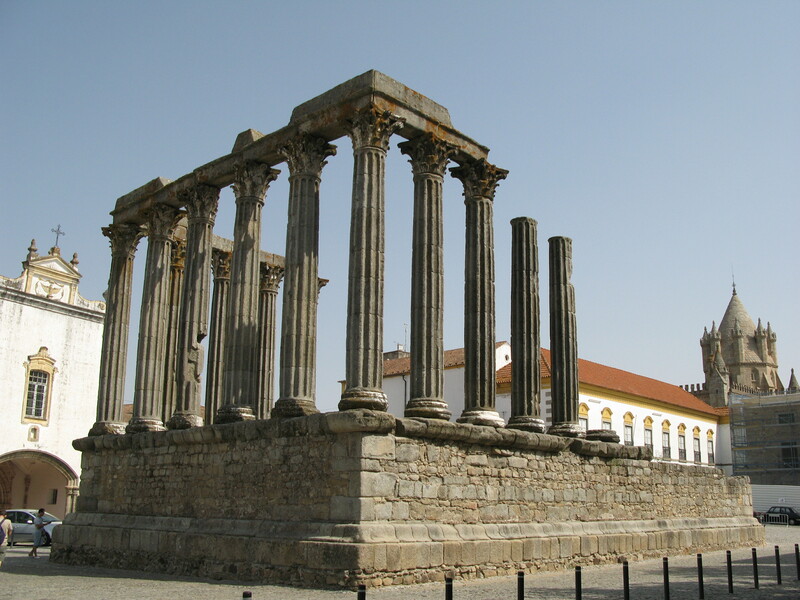 The temple was built in the 1st century AD in the main public square (forum) of Évora – then called Liberatias Iulia – and modified in the 2nd and 3rd centuries. Évora was invaded by Germanic peoples in the 5th century, and at this time the temple was destroyed. Nowadays its ruins are the only built vestiges of the Roman forum, in an open square fronted by the cathedral and the bishop’s palace. The ruins of the temple were incorporated into a tower of the Évora Castle during the Middle Ages. The base, columns and architraves of the temple were kept embedded in the walls of the medieval building; the temple-turned-tower was used as a butcher shop from the 14th century until 1836. This new use of the temple structure helped preserve its remains from further destruction. Finally, after 1871, the medieval additions were removed. Restoration work was directed by Italian architect Giuseppe Cinatti. The original temple was probably similar to the Maison Carrée in Nîmes (France). The Évora temple still has its complete base (the podium), made of both regular and irregular granite stone blocks. The base is of rectangular shape and measures 15 m × 25 m × 3.5 m. The southern side of the base used to have a staircase, now ruined. The portico of the temple, now missing, was originally hexastyle, six columns across. A total of fourteen granite columns are still standing on the north side (back) of the base; many of the columns still have their Corinthian-style capitals sustaining the architrave. The capitals and the bases of the columns are made of marble from nearby Estremoz, while the columns and architrave are made of granite. Recent excavations indicate that the temple was surrounded by a water basin.